CASINO PRINCE (AUS) (Bay 2003-Stud 2008). 5 wins-3 at 2, AJC Chipping Norton S., Gr.1. Leading Aust. First Season Sire 2011-12. Sire of 479 rnrs, 320 wnrs, 15 SW, inc. All Too Hard (MRC Caulfield Guineas, Gr.1), Escado, Hooked, Star Rolling, Longport, Mighty Lucky, Casino Dancer, Fine Bubbles, Sookie, Cool Gambler - Lim's Cruiser (Sing. ), Cantbuybetter, Jackpot Prince, Phrases, Slots, Timeless Prince, SP Casino Fourteen, Sweet Deal, etc. CHAPTER FIVE, by Octagonal. Unraced. Half-sister to SUBTLE COVE, SOILED. Dam of three named foals, one to race. SUBTLE COVE (Mull of Kintyre). 6 wins from 1300m to 1600m, A$315,815, MVRC Sunline S., Gr.2, STC Boat & Trailer Show H., Theslipper.com.au H., 2d STC Canterbury Night Racing H., Hastie Services H., 3d Qld Tatt's RC Winter S., Gr.1, STC Millie Fox S., Gr.3, 4th AJC Wiggle H., L, Aspiration H., L, Newcastle JC Tibbie S., L.
SOILED (Sandpit). 9 wins from 1200m to 1600m, A$334,400, QTC Sir Edward Williams H., L, Qld Tatt's RC Centenary Classic Mile, L, BRC Members Cup, L, AJC Quasar Constructions H., Hawkesbury RC Blakes Marine H., 2d Hawkesbury RC Rowley Mile, 3d Scone Cup, L, 4th Hawkesbury Gold Cup, Gr.3. Bored. 4 wins from 1100m to 1800m, 2d Port Macquarie Cup. Subtle Winner. 3 wins at 1400m, 1600m in 2017-18 in Aust. Subtle Grey. Winner at 1400m in 2018-19 in Aust. Infomertial. 3 wins to 1500m in 2017-18 in Aust. Paddy's Sister. 4 wins at 1400m, 1650m in Aust. Under the Card. 2 wins at 1000m, 1100m in Aust. My Prince Tristram. Winner at 1200m in Aust. Cahermaculick. Winner at 1200m in Aust. Subtle Miss. 3 wins. See above. Miss Whamm. Placed in Aust. Reigart - Fly High (H.K.) (Iglesia). 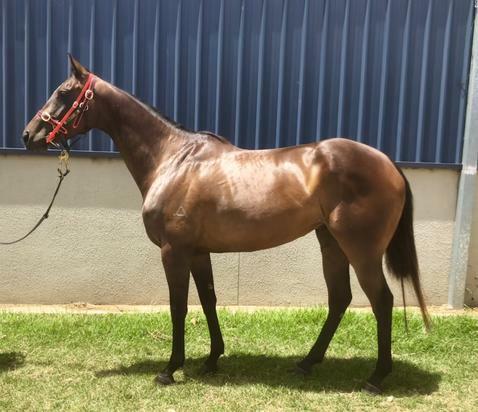 5 wins-3 at 2-to 1100m, A$236,000, HK$1,753,875, Toowoomba TC Magic Millions 2YO P., BTC City Pacific Finance 2YO H., Toowoomba TC Fitton Insurance Hopeful 2YO P., HKJC Repulse Bay H., John Peel H., 2d HKJC Po Yee H., Lamma Island H., 3d GCTC Magic Millions 2YO Classic S., RL, HKJC Hong Kong Challenge Cup, St George's Challenge Cup, Gough H., Hereford H., Arc de Triomphe Champions H., Canal H., 4th STC Silver Slipper S., Gr.2. Zululu. 6 wins to 1350m, QTC Seek.com.au H., BTC Queensland Pine Company H., 2d BTC Stargames H., QTC Just Now H., Dulcify H., Hahn Premium Dining Serve H., 3d QTC Bridgestone Airstep H. Producer. HULK (Greenlander). 9 wins at 1200m, S$481,608, Singapore TC Kranji Sprint, L, Kranji S., Juvenile Championship, Class 1 H.-twice, Open H., Class 3 H., Benchmark 67 H., 2d Singapore TC Jumbo Jet Trophy, L, Fischer S., L, 3d Singapore TC Graduation H., Class 3 H., 4th Singapore TC Lion City Cup, L.
Lucky Morna (Ferocity). 2 wins-1 at 2-at 1200m, A$112,675, BRC Becks 2YO H., 2d BRC Doomben Slipper, L, 3d BRC Vo Rogue P., Gr.3, Skyracing.tv 2YO H., 4th BRC Hampden S., L. Producer. Cranny Colleen. Winner. See above. Kamari. 6 wins. See above.